Edraw is used as an ansoff matrix software coming with ready-made ansoff matrix templates that make it easy for anyone to create good-looking ansoff matrix. 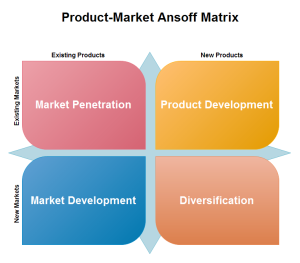 The ansoff matrix templates are customizable, printable and free. Edraw can also convert all these templates into PowerPoint, PDF or Word templates. Creating an ansoff matrix in Edraw saves much energy and time. It only takes a few seconds to choose a basic template, insert text , and add change the appearance. If you want to use a ready made template, go to ansoff matrix templates page and choose the Ansoff Matrix that best suits you. When you finish creating your ansoff matrix in Edraw, one click on the Export button will perfectly transfer your drawing into MS PowerPoint presentation. 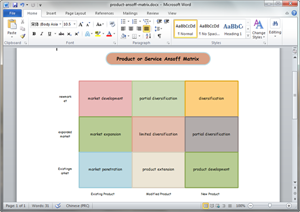 You can create high-quality ansoff matrix diagram with the least effort. To redesign a template, first you need to download Edraw, and with this powerful software, you can do a lot more to customize your diagram. 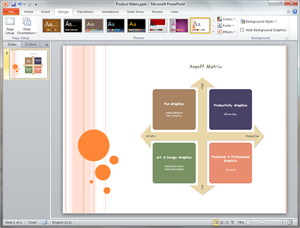 All templates in the software gallery windows can freely change in color, theme and effect. All are simple, only with a single click on the Export button, you will convert your ansoff matrix template into PDF format with high quality. 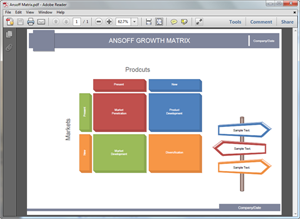 You can view the PDF Ansoff Matrix Template to view the quality. Market Penetration - the organization tries to grow using its existing offerings (products and services) in existing markets. In other words, it tries to increase its market share in current market scenario. Market Development - new products are introduced into existing markets. Market Development - this strategy entails finding new markets for existing products. Market research and further segmentation of markets helps to identify new groups of customers. Discover why Edraw is an excellent program to create ansoff matrix. Try Edraw FREE.